The book jacket offers: “Powerful and provocative, brilliantly written, The Unspeakable is as unforgettable as it is unsettling. Told in the first person by Rian, it centers on the conflicted being of the white male under apartheid. Unlike many of the great novels of the era, it renounces any claim to the relative safety zone of moralistic dissociation from the racist crime against humanity, and cuts instead to the quick of complicity. It is sometimes said of Albert Camus’s The Stranger that everything would have turned out very differently, had the murder only taken place ‘a few hundred miles to the south.’ This is that South with a vengeance. The website group Authoramp, made up of experienced book marketing professionals, has published an interview with Anderson about his book that offers further insight. The Amazon site for the book includes five-star reviews by Austin College faculty Carol Daeley, professor of English, and Patrick Duffey, associate dean of the faculty and professor of Spanish. The reviews are included here. Peter Anderson is a colleague and friend. 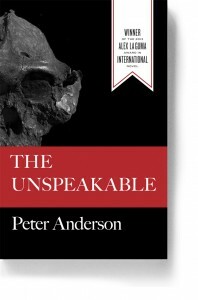 Otherwise I might never have known about his gripping, transcendent novel of South Africa, The Unspeakable. Don’t let the experience of reading it get away from you. Anderson manages to meld richly individual realistic detail about settings and characters with a profound grasp of the mythic in a story that is layered in time yet moves toward its necessary conclusion with the force of a powerful river. Reading the novel, I was constantly reminded of Faulkner’s claim that “The past is never dead. It isn’t even past.” Anderson is a quite different kind of writer than Faulkner but they are connected in their ability to embody the shadows cast on their respective countries by their racial histories. Like Faulkner, Anderson makes the specific history of his own country part of the universal human experience of guilt, betrayal, and incomprehension. There are better and worse ways of dealing politically with a country riven by the histories of Dutch, English, Xhosa, Zulu, Indian, Jew, men, women, rich, poor, but there are no easy ways of dealing with it: what Anderson gives us is not this kind of abstract analysis but the truth underlying it, as it functions for particular characters in particular settings, each of them impinging on the others in particular ways. Mythic patterns of blood sacrifice are embodied in events that are firmly grounded in the lives and identities of the characters. Two characters approach nobility: a white woman and a black man. But all the characters are vivid, even the ones we see only briefly. The novel moves with exceptional grace between the darkness within individuals and the social implications of that darkness. Samuel Johnson, who knew a thing or two about this dynamic, declined to believe that human beings, deeply flawed as we are, would ever manage to create and sustain the ideal societies we can imagine and yearn for. We cannot walk away from the past into a clean future. The Unspeakable demands that we recognize that some things cannot be atoned for, cannot be erased. It is almost unbearably honest. Besides that, it’s a damned fine story. Anderson’s novel is nothing less than one of the most probing explorations of what Conrad called the heart of darkness, the origins of evil, the horrors that every day, supposedly “normal” people are capable of. The novel is as brave and unflinching as it is authentic, tightly constructed, and hauntingly imagined. Originally from South Africa, Anderson has been a member of the Austin College faculty since 2006. After earning his bachelor’s degree in English and philosophy with a minor in Afrikaans at the University of the Witwatersrand in Johannesburg, he began his career as a secondary English teacher. He received a second bachelor’s degree in drama and film from the same university several years later, and then received a Fulbright award to study creative writing at Boston University, where he earned a master’s degree, and a few years later, a Ph.D. 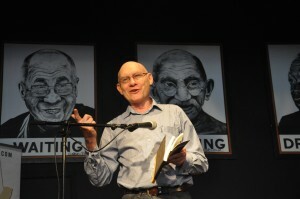 He returned to South Africa for nearly two years to teach at University of Port Elizabeth, then returned to Boston University to teach before taking the position at Austin College The author of a previous collection of poems, Vanishing Ground, Anderson’s work in fiction and poetry has appeared in numerous literary magazines and has been anthologized in both America and South Africa. The Unspeakable is his first novel.